The incoming freshman with a knack for building electronics already had what so many people go to college for: potential job offers, and an impressive resume. He’d worked as an intern at Intel for two years. And after he crossed the high school threshold and had been handed his diploma, some companies began asking if they could talk to him about work opportunities. As if trying to decide what university to attend wasn’t hard enough, the 18-year-old had to also measure the value of starting to earn real money on his professional track. Ultimately, Hudy decided on enrollment at ASU. Part of the rationale was that a degree would help him advance faster and farther once his career started. But a large part of it was the difficult decision to step away from the very lifestyle that had made him such a desirable commodity. In essence, he wanted a new start. He wanted to be a normal teenager. Hudy’s rise to prominence started where many Americans might aim as a final job destination: the White House. The Anthem native was 14 years old when inventing a high-powered marshmallow gun earned him audience with President Barack Obama — and a ton of positive media exposure after video of Hudy and Obama launching marshmallows onto White House walls made the daily news rounds. Talk to Hudy about that 2012 experience now and you can almost hear a virtual eye roll in his voice. He has told the story too many times to recall. Yes, it was a cool moment. And, yes, he has been invited back to the White house two more times — including once as first lady Michelle Obama’s guest during a State of the Union address. But while splatting a marshmallow onto government property put him on the short list of this administration’s “young people who matter” brigade, these intersections with the leader of the free world don’t tell Hudy’s story. He’s not a political pawn. He’s a maker. And though that marshmallow gun was a winning early creation, it’s a footnote on his list of homemade products that includes a 3-D body scanner and a solar-powered computer. He sounds a bit dismissive of that candy cannon now, but he owes a lot to it. Carrying the orange and white tangle of tubes into a room of other inventors in 2011 was, perhaps, the most impactful thing he has done in his young life. Thirteen-year-old Joey Hudy sounds like he was a rather typical teenager. Both he and his mother, Julie Hudy, describe him as shy and a bit antisocial, someone who spent a lot of time indoors or in his room. Hudy takes it a step further, saying he didn’t have any friends. So he spent his time inventing. He made rockets out of soda bottles and chairs out of cardboard, and he fiddled with Snap Circuits, which are, basically, electronics experiments for kids. He hadn’t. But after Julie Hudy heard Coda talk more about these events — part science fair and part social event for inventors — she was convinced Hudy should attend one. As part of his 13th-birthday haul, he received two tickets to the Bay Area Maker Faire — from Coda. And just for kicks, Joey decided to enter his marshmallow cannon into the Young Makers field. It was accepted. As Hudy and his mom explored the floor at that Maker Faire, he was amazed by all the cool things people had made. And there were quite a few people interested in his cannon. More importantly, these were people who “got” him. He felt like he finally found a place he fit in. But there was an aspect of the faire that worried him. It’s a funny anecdote now because in the years since that first step into the Maker Faire culture, Hudy has become one of its stars, a young man who has spent the past few years flying around the world giving speeches about his inventions, his trips to the White House and how the Maker Faires have changed his life. After one of these speeches in Rome, he was approached by Brian Krzanich, Intel’s CEO, who said he wanted to hire Hudy. There were smiles and appreciative comments. But after Krzanich left, Hudy had a question for his mom, “Do you know who that was?” It wasn’t a prompt for glory. Hudy had no idea of Krzanich’s ties to Intel. He soon learned more as he was hired as Intel’s youngest corporate intern ever; a feat that’s almost as impressive as being named one of the “10 Smartest Kids in the World” by Brilliant.org. Accolades aside, Hudy doesn’t get too wrapped up in his resume. He’s more likely to talk about how Maker Faires opened up his life to the point that he could feel comfortable enough to visit the president or hang with the head of a major tech company. “It not only changed my future outcome, it changed me as a person,” he said. Now it’s time for this young person to change again. One thing about being a smart guy immersed in the world of math and electrical engineering, you tend to see things as they are, without the taint of hubris or hope. And as Hudy and his mom looked at his post-high school options, there was this realization about his White House days and status as a Maker Faire star: It couldn’t last forever. And though Hudy will continue to be part of the Maker Faire culture – attending faires when his schedule allows, though not speaking at them as before — he needs to focus on his time studying engineering on ASU’s Polytechnic campus. “He can’t do both things,” Julie Hudy said. But he can continue to make things in the same manner he always has, but this time with a lot more tools and bigger labs. And it will be interesting to see how he adapts to life as just one of the many brilliant minds making a path through ASU’s ranks, not as the kid who shot marshmallows with President Obama. ASU's latest class of incoming freshmen has a diverse mix of students with academic credentials eclipsing the mark set by last year's pack of incoming students. Amani Burton is looking forward to meeting a new person every day. “It excites me because I can find so many clubs and organizations that fit me,” said Burton, who’s from Nevada and will be majoring in Sports and Media Studies in the W.P. Carey School of Business. In keeping with the university’s mission of encouraging accessibility for all, the percentage of minority students in the freshmen class has increased: 38.6 percent this year, compared with 38.4 percent last year. In fall 2007, it was 29.4 percent. Burton, who is African-American and Filipino, says that’s important. “It’ll add more cultural diversity to the college, which is great, although ASU’s population is already so diverse, with students from all over the world,” he said. Kent Hopkins, vice president for enrollment management and services, said that providing opportunity for everyone is part of ASU’s mission. The incoming freshmen are also academically accomplished. As a group, their average high school grade point average is 3.41 and their average SAT score is 1126, the highest averages of any ASU freshman class. Last year, the average grade point average for the incoming freshmen was 3.4, and in fall 2007, it was 3.34. The average SAT or ACT – in which the ACT score is converted to an SAT scale – was 1118 last year. It was 1078 in fall 2007. Scott Fitsimones of Phoenix is one of the elite students coming to ASU. A graduate of Arizona School for the Arts charter school, he is a Flinn Scholar – an honor awarded only to the most accomplished students who choose to go to one of the state’s three public universities. Fifteen of this year’s 21 Flinn Scholars chose ASU. Fitsimones has been designing smartphone applications since he was 15, and dreamed of attending Stanford University. But he was drawn to ASU’s reputation for innovation and support of student start-ups. Fitsimones, who will be living in Barrett, the Honors College, is considering a major in computer systems engineering or another type of engineering. He’s been experimenting with three-dimensional printing. ASU continues to draw students from beyond the state’s borders. 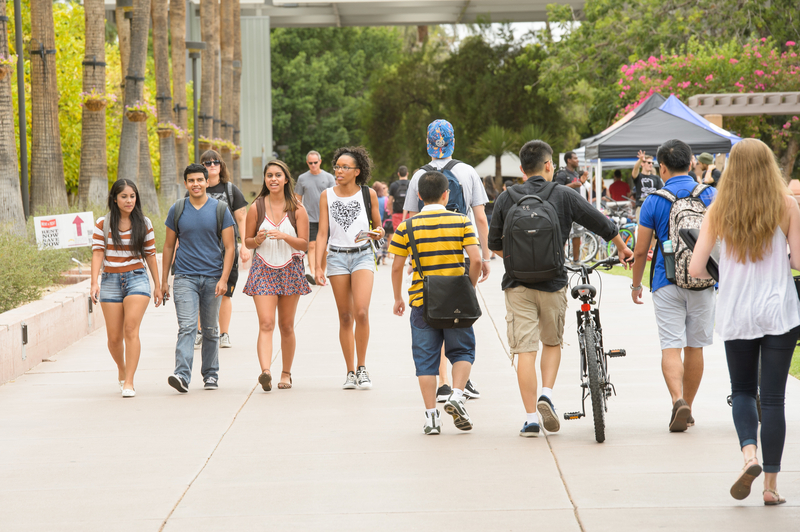 Nearly half – 46 percent – of the incoming freshmen are from outside of Arizona. Twelve percent are from California, and half of those students are minorities. One of the 1,406 freshmen from California is Taylor Lucido, who graduated from high school in Brentwood, a town about an hour outside San Francisco. Lucido, who will be living on the Tempe campus and majoring in philosophy, is from a Sun Devil family, with several relatives who are ASU graduates. “My cousin got married at Old Main last year. I fell in love with the campus and it’s always been my dream to go there,” she said. This freshmen class will top 11,000 for the first time, and Hopkins said that each of the five campuses provides a unique environment for the incoming students. ASU at Lake Havasu City will have 42 freshmen, and ASU West will be home to 360 freshman. ASU Polytechnic will welcome 525 freshman and about 1,400 freshman will begin at the Downtown Phoenix campus. Nearly 9,000 freshman will begin their Sun Devil experience on the Tempe campus. “We have such a wonderful mosaic of campus opportunities for our students,” Hopkins said.